What is the Accu-Chek Aviva? What is this device used for? 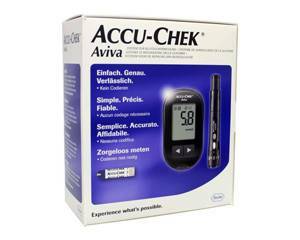 The Accu-Chek Aviva is a blood glucose meter. It is designed for people with diabetes who wish to check their blood glucose levels. The Accu-Chek Aviva requires just a small blood sample (one droplet) to offer an accurate reading. The results are shown instantly on the display. The Accu-Chek Aviva meets the new ISO 15197:2013 standard for accuracy (this requirement will be obligatory as of 2016) and is very easy to use. You can order the Accu-Chek Aviva online via Dokteronline.com’s partner pharmacies. If you have type 1 or 2 diabetes or are at a higher risk of developing these conditions, it is important that you check your blood glucose (blood sugar) levels regularly. If your blood sugar is too high, you will need to take medication to lower it. If your blood sugar is too low, then you will need to eat or drink something with sugar right away to reduce or prevent the symptoms associated with hypoglycaemia. The Accu-Chek Aviva tells you within five seconds if your blood contains too much or too little glucose. You only need one drop of blood from your fingertip to perform this test. The Accu-Chek Aviva takes ambient temperature and humidity conditions into account. This makes the results highly accurate. Place the batteries into the device. Read the manual for instructions on what to do before using the meter for the first time and how to set the correct time and date. Remove the Aviva test strip from the packaging and insert into the meter according to the instructions in the manual. The meter will turn on automatically. A flashing blood drop symbol will appear on the display. Wash your hands with water and dry thoroughly. Place the lancing device firmly against the side of your fingertip. Press the release button all the way down to prick your finger. Gently squeeze your finger to get a blood drop. Allow the blood drop to touch the front edge of the yellow window of the test strip so that the test strip can absorb the blood. When there is enough blood in the test strip, the hour glass symbol will start to flash. Remove your finger when this happens. Remove the test strip. The device switches off automatically. Dispose of the test strip after use. The Accu-Chek Aviva has a memory that stores up to 500 test results. You can view previous readings by pressing the arrows on the device. It is possible to transfer data directly to your computer with specialised software and an infrared cable. See the manual for step-by-step instructions. If your blood glucose levels remain too high or too low, you should talk to a doctor. Always consult a doctor if you don’t feel well, even if your test results indicate nothing out of the ordinary. Never alter the dosage of prescribed medication based on your test results without consulting a doctor first. Consult a doctor on the use of the Accu-Chek Aviva if you suffer from haemophilia or use blood thinners, or if you want to use the glucose meter to measure a child’s glucose levels.